Select hiding places that cannot be exploited by the enemy. Either feline or flashy box. Mum got to meet The Crew's mom last night. They took a class on Photoshop through a local school. Maybe mum can learn how to do fancy pictures like Zoolarty. Even if they are half that good, she will be doing good. 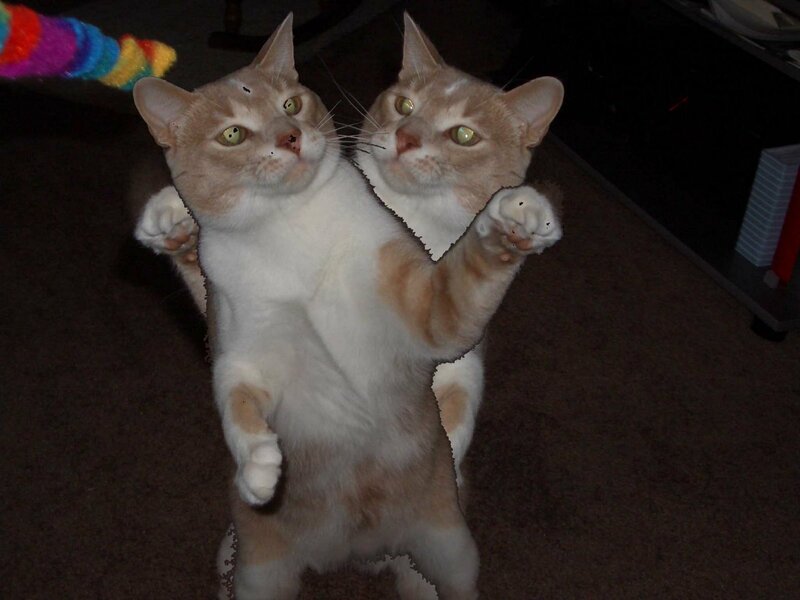 Then she made two of me and flipped me around. I could be boxing with myself. Then she moved me around and put in a different background. So it will be interesting to see what she comes up with when she has more time. Plus if she isn't watching the Packers getting beaten. Mum missed a lot of the game since she was at the class, she said that was OK, it is just a game, but they did make it close towards the end. Plus people gotted hurt. I got my Secret Paw assignment. I am working and thinking of what I can send my furiend. It could be you! We are supposed to get a storm with white stuff this weekend. I hope that mum has a big supply with treats in the house. Don't want to run out! Plus have you noticed anything different about me lately??? Any guesses? I got inside mum's little table that is next to the bed. I was looking to see if she had any treats for me hidden in their. No, their wasn't. She has a few treats inside for herself. And lots of papers and such. I didn't stay in here long, not a very comfy place to nap. But strange that she goes to bed with the little flashy box too. At least I don't think that she sleeps with it, but every now and then she pulls it out when I join her to sleep. Strange lady. 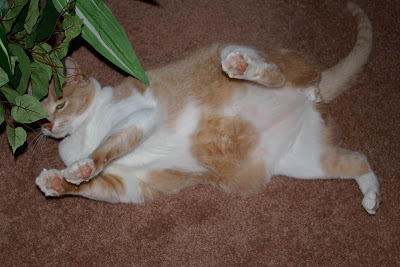 A cat sees no good reason why it should obey another animal, even if it does stand on two legs.- Sarah Thompson Yep, that is me, just doing what I want. I know someone commented a while back about me being on the kitchen counter tops. But hey, if I want to go there, I will. 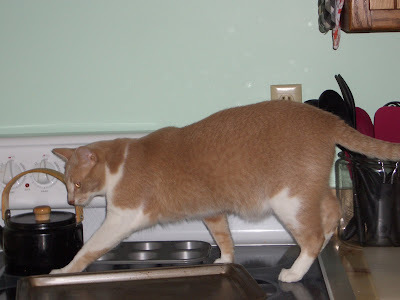 Mum has tried all of the tricks to keep me off the counters, but since she isn't here all of the time, I go where I want. I did get my pads a bit singed when I stepped on the cooking thing. Mum and I have both learned about staying away from that when it hasn't cooled down. She makes sure she has something on the hot spot until it cools off. Mum got all domestic this weekend. She tried out Darling Millie's mum recipe for English Muffin Bread. It turned out good and mum has eaten some of it. She didn't wait even to toast or put butter on it. Good right out of the pan. Then as that got finished she made herself a turkey and cheese omelet. So the omelet and the bread were her lunch. Then she made stuff later in the day, but that all went in the big cold box for taking to work. We didn't see Mr Hawk yesterday at all. The hawk is most likely a Cooper's Hawk, the same one that attacked and killed a mourning dove back in February. The squirrels were around, all four of them. Mum is bummed as she had to go back to work today. That means I have peace and quiet at the house all day long. Naps and watching fevvers, sounds like a wonderful day. Well, we had excitement here this morning. It started out quietly, mum got me breakfast, ate her breakfast and readed the paper. Then she went to get dressed. She sat down on the end of her bed and looked out the window into the crabby apple tree. There staring back at her was Mr Hawk! Can you see him sitting on the branch above the ginger cat? You can biggify any of these pictures if you need to! Mum expected him to fly away real quick, but he didn't. She had time to go get her flashy box thing and takes lots of pictures. He stay around long enough for mum to finish getting dressed and even to go into the other room to take pictures. He must have been keeping his other foot warm, but look at those talons of his! 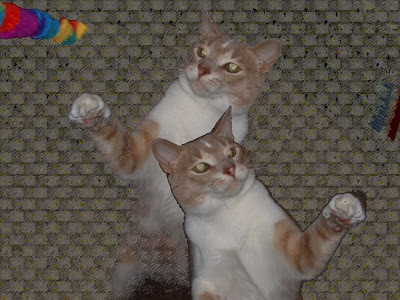 We kitties don't have any claws that long and big to fight with. But then a cheeky little squirrel jumped up and ran up the tree and scared Mr Hawk away. I would have figured that Mr Hawk would have attacked the squirrel and had a snack! You can see Mr Hawk flying away and Mr Squirrel who is a bit out of focus, but above and to the right of where the hawk's tail is. Mr Squirrel then proceeds to attack mum's birdie feeder! He kept working at it until he got it open! Then jumped back into the tree. See the top flap of the feeder is hanging open to the left side of the feeder. Then back down to stuff his face. So mum figured she would go out and scare Mr Squirrel away, but when she went to go out the back door, she saw Mr Hawk had just moved to a new tree. Mr Squirrel ran over to that tree and Mr Hawk totally flew away! But mum took over 100 pictures of the hawk and squirrel. So we had lots to watch outside our windows this morning. Mum finally got pictures of Mr Hawk, just hanging around. She is furry happy about that. Then she finally got to doing the rest of her morning working stuff. Cleaning, paying bills etc. So she opened the little room and there is this one last plant that mum still has and it is now blooming. Well, you know me, I need to check this out. Then jump up for a really close look. Yes mum I do want to chew on this plant! OK, I will just smell the flowers. Then mum picked me up and we left the room. The door is now closed and I can't get at the flowers anymore. Hope the rest of you have an exciting weekend too! Or not! My first guest picture for Funky Fang Shui Friday. Ms Parker of Perfectly Parker. When zoned out on nip, make sure you look cute. 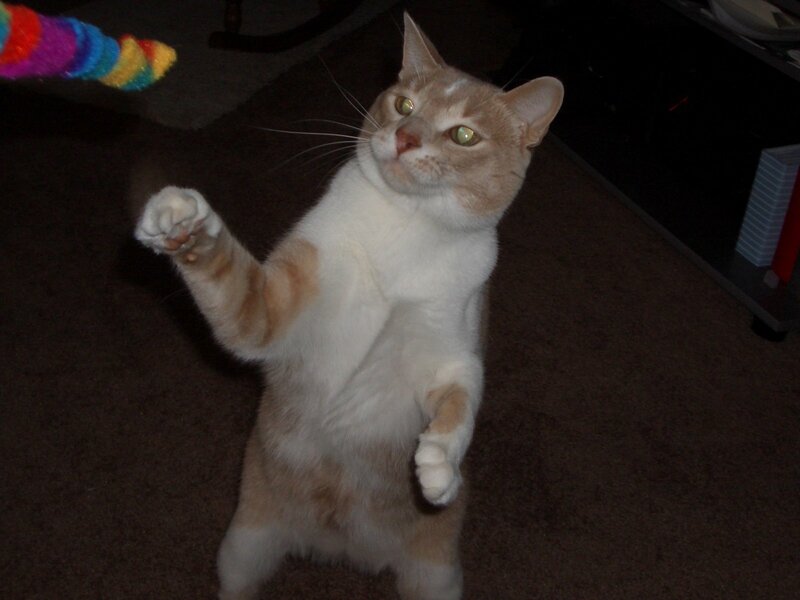 Do not get aggressive, this will result in the total withholding of nip in the future. 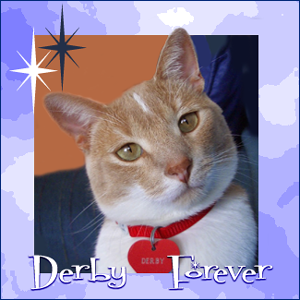 If you would like to be part of Funky Fang Shui Friday, send me a picture at derbycat AT wi DOT rr DOT com. 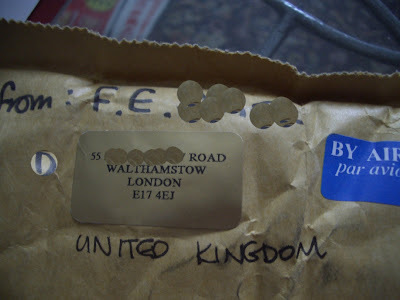 You know the drill, substitute the proper symbols for words in the address. Hope everyone had a good Thanksgiving, well except for Fat Eric. He was bummed that we had a holiday here in Mericky and they didn't have one in the UK. But I invited him over to share my turkey dinner. I even have left overs. Then after this nice meal I napped, or at least I tried to on my nice new bed. Mum and Grampie were watching the Packer game. They kept clapping and cheering the team on. The Packers won, so they did a good job. Then Mum and Grampie left to have their turkey dinner. After a while mum came home and was getting the turkey sleeping sickness. She fell asleep on the couch. She has been so busy on her week off I hope she rests more today. She isn't one for getting up and going shopping on a day like today. She does not like crowds and doesn't need the stuff they are selling anyway. I did get a little bit of the liquid from the soup mum made the other day, but not much. The soup has onjuns in it, so it isn't good for kitties. That cupboard that I got into only has cooking bowls and such. No actual foods. Mum loves this kitchen as she has lots of cupboards for all of her stuff. Everyone have a great day. If you are traveling, travel safely. I know the food will be good, eat up everyone. Then you can all get a sleeping sickness. Part of the day will be football since the Packers will be playing. Mum is planning a simple lunch for her and Grampie so that they can watch the football. 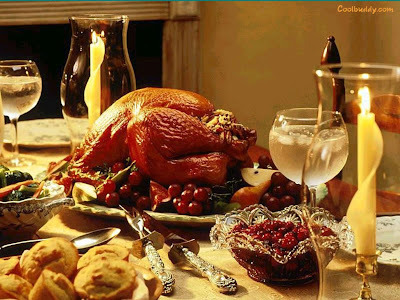 The big dinner will be cooked by the chef where Grampie lives, mum will not do a huge dinner for just the two of them. There is a poem about going to Grandma's house for Thanksgiving. Mum made this for her mum many years ago. When Grampie stopped living in his house, mum claimed this back. Hope if you went over the river and through the woods, you did or do so safely. And we are having a 'White Thanksgiving' as it snowed overnight. ::singing:: I'm dreaming of a white Thanksgiving! Just like the ones I've never known. Where the tree tops glisten, and children listen, to hear turkey gobbles in the snow. Here is a picture mum took these pictures this morning before she pushed the snow off the driveway. Guess I will nap now before the football game. Hope I get some turkey later. Oh yeah, one last thing, what am I thankful for? 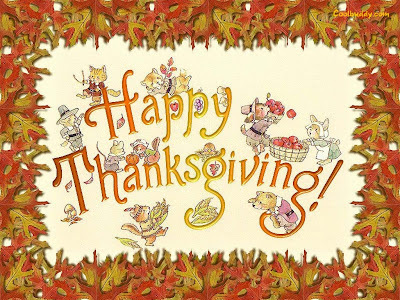 I hope and wish that all kitties who are in shelters find their furever homes soon and can have a great Thanksgiving next year. I jumped in the cupboard and checked out all of the stuff that mum has to use when she does food for herself. So many things in here. I especially like to get in this cupboard as it is deep and mum can't get inside to pull me out. She has to wait until I decide to come out. She isn't happy when I managed to slip in here. Mum was making soup for Grampie today. Plus she has been working outside a lot. Monday Grampie came over and watched as she walked on the roof of the house. She used the big blowing thing to make the leaves get out of the gutters. Then she cleaned up all the leaves again. Today she pushed around the grass eating monster all over the yard. Then she put that away and got the snow eating monster working. If you are supposed to rest on your vacation, that is certainly not happening. This lady has her priorities straight. We are simple and we are sweet. I hope that she is not implying that we cats are simple. If she is, time to leave a poop on the pillow. I have lots of mum time this week, she is on vacation this week. So no getting up early for her. This weekend mum went to a dinner and awards thing for her racing club. She wented away on Saturday afternoon and didn't come home until Sunday afternoon. But she had a nice time and forgot to take her flashy box with her so no pictures of the party. The biggest highlight of the stay was a HUGE, whirlpool bathtub in her hotel room. She loved it and said it would have made a great tub hockey rink for us. Since this was the 60th anniversary year of the club, various people sponsered a free dinner. You got one entry in the draw for each event you worked. Well mum won, so she got her money refunded for the dinner. Then she won a door prize, which amazingly I can use. Then she bought a few raffle tickets and won some power tools. When she came home, she left the door open and I went into the garage to check out the stuff, plus some of the leaves that had blown inside. The big door was down, so no chance to get outside, outside. I jumped into the trunk of the metal monster, this blue thing looks interesting. But look at all of the stuff that mum had in the trunk. Wow, what a haul. She said lots of people were kidding her about her good luck. Must have been her weekend. She said the power tools are expense stuff, and she didn't have a cordless drill. So mum isn't sure if this was supposed to be a pet bed or maybe a cushion for little people to sit on the floor. They had lots of these to give away and most of the people figured they were pet beds. So I checked it out. Yes, it is comfy. I think this will do just fine. Thanks mum for thinking of me while you were out partying. Mum has to figure out just where to put this. When she took the picture it was in the middle of the floor and she won't leave it there. I might get stepped on. I got my sample of Feline Greenies in the mail on Saturday too. Yum. I have decided to give this a try on doing my own Fang Shui but maybe just a bit funky. 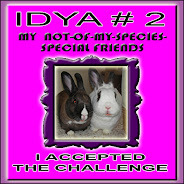 I am taking a picture of me and letting you know what I think it the means in terms of our balance in life or ch'i. Beware of exposing tender parts. They may be attacked or tickled causing you to lose ch'i. Yes, this is furry true. Mum is more likely to pet or tickle me, but an enemy might wish to exploit my vulnerability here. If you wish to submit a picture to me to do Funky Fang Shui on you can e-mail it to me at the following derbycat AT wi DOT rr DOT com. You know the drill, substitute the proper symbols for words in the address. Otherwise, Happy Friday. The weekend is almost here. Mum and I got a special package from Fat Eric and his mum. During one of the recent chat parties I mentioned how much mum liked these sweets that you can readily buy in the UK. Well they sent us a care package. Mum opened the package and got her sweets out, but I didn't see a toy. Oh wait, I remember now, they sent an e-mail explaining. Eric closed up the package before they put the toy in. I hope he has fun playing with it. So mum has a fresh supply of Glacier Mints and the chocolate is always welcome. 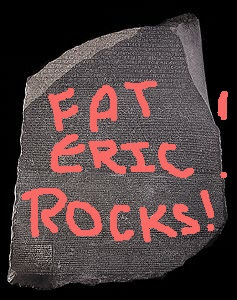 Thanks Eric and your mum.